The Jesus Trail / Holy Land pilgrimage allows you to experience the Holy Land in a new way. Walk where Jesus walked. See the Holy Land in a more intimate way. With this pilgrimage, you get to experience a walking pilgrimage along with seeing all the Holy Sites of the Holy Land. You will leave Nazareth and walk through the countryside making your way to The Sea of Galilee. “and leaving Nazareth, He came and settled in Capernaum, which is by the sea, in the region of Zebulun and Naphtali.”~ Matthew 4:13 Once you arrive to the Sea of Galilee, just sit back, relax and enjoy the Holy Land. Enjoy the many sites and beauty where Jesus performed His miracles, stand in awe and feel His presence. Truly walk where Jesus walked! A beautiful and exciting challenge awaits you! You will arrive in Tel Aviv and meet your group. Once together, we will make our way to our resting place for the night in Tel Aviv. The Old Jaffa area will be our place, a very vibrant and cool part of Tel Aviv. Rest, explore and enjoy your evening. The days and distances described in this itinerary may be modified for circumstances beyond our control. Arrive in Tel Aviv, transfer to resting place. Arrive in Tel Aviv, gather your luggage and meet in the arrival hall. Your guide and group will be waiting for you. Transfer to our Boutique Hotel in the Old Jaffa area, rest, explore and enjoy your evening. We will enjoy breakfast at our Hotel. After breakfast, we will make our way to Nazareth. Upon arrival, we will check into our quaint accommodation, and head out to explore Nazareth. As we stroll the streets of Jesus's hometown, we will make our way to the Church of the Annunciation, which includes St. Joseph Church. This is believed to be the site of the workshop of Joseph and the home of the Holy Family. We will also visit the Church of the Incarnation. Inside we will view the Grotto, which is the remains of the house of the Blessed Mother and where the Angel appeared to her and announced the good news. We will stroll over to Mary's well, this is where Our Blessed Mother would have walked as a child to draw water from the spring. We will end our day walking the markets of the Old City. After our traditional Arabic breakfast, we will start our first day of walking with our packed lunch. We will be walking to Cana today, 16 kms ... 10 miles. We will ascend out of the old city, walk to Zippori National Park. We will have the chance to visit the archeological ruins of the main administrative city in the Galilee at the time of Jesus. Enjoy our packed lunches in the cool shade and have a chance to admire the exquisite Byzantine mosaics. We will then make our way through Mashhad and finally arrive in Cana. The traditional site of Jesus' first miracle, turning water to wine at the Wedding. We will check into our hotel, rest and have a chance to freshen up before we head over to the Wedding Church. Enjoy a nice traditional dinner and rest. We will enjoy another nice Arabic breakfast and head out for our second day of walking. Again with our packed lunch, we will walk to Ilaniya. A small Jewish farming village. Today we will walk, 9.5 kms ... 6 miles. Again we will ascend out of town, we will walk along a forest ridge with peaceful valley views. Plenty of shaded areas to enjoy our packed lunch. We will arrive early into Ilaniya and check into our B&B. Time to rest and freshen up before we are transferred by private van to Mount Tabor. Mount Tabor is the mountain where Christian tradition places the Transfiguration of Jesus. We will return to our B&B with time to relax and enjoy the grounds and the swimming pool. After a delicious breakfast we will head out for a beautiful day. Today we will walk to Arbel, it will be 18 kms ... 12 miles. This will be one of our longest days but one with beautiful views. We will see the Sea of Galilee for the first time today! As we walk today we will see an ancient Roman Road and the Horns of Hattin. The Horns of Hattin is a volcanic structure where a famous Crusader battle took place. We will enjoy our packed lunch in the cool breezes from the Sea. We will head down the rocky hillside to Nebi Shu'eib, the holiest shrine for the Druze religion. Pants below the knee must be worn for both male and female to enter the grounds. We will rest in the picnic area and enjoy our lunch. You can visit the tomb of Jethro, father-in-law of Moses, if you wish. Some may just want to relax in the shade and take a break. After this break we will walk along the road into Moshav Arbel, where we will be staying in our quaint hotel. Today is the day we walk into Capernaum. The region where Jesus did most of His ministry. We will walk 19kms ... 12 miles. You will feel the excitement today as we walk. We will arrive in Capernaum today! 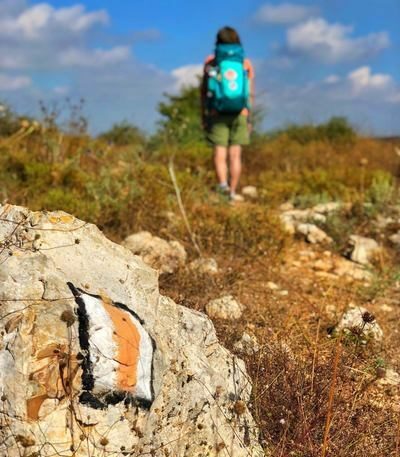 We will head out after another delicious breakfast and make our way up to Arbel Cliffs, this is a park with stunning views and ancient cliff dwellings and caves. As we descend from the cliffs we will take a nice break in the shade, enjoy a snack. You may choose to explore a cave or just relax, this is up to you. At the bottom of the hill, again we can take a little break for fresh water and ice cream. A nice little break. The descent is steep and the breaks will be well deserved. The rest of the day is through farm land until we reach Tabgha. We will enjoy a nice lunch before entering Tabgha. The afternoon walk will take us from Tabgha, which is the site of the feeding of 5000, along the Sea of Galilee to Capernaum. Along the way we will visit the church of St. Peter. This is the site where Jesus prepared a meal for His disciples. We will then make our way up a small ridge to visit the Mount of Beatitudes, the traditional site of Jesus' Sermon on the Mount. We will finish our journey as we walk into Capernaum. We will wander the ruins of this city which was the center of Jesus' ministry and have a moment of prayer in the church built over the home of Simon Peter. 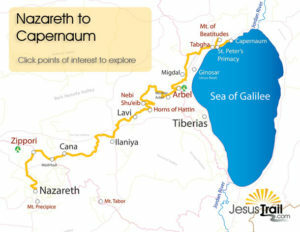 After our time in Capernaum, we will make our way to Tiberias, via private van. Tonight we will celebrate our walk and enjoy a relaxing evening in Tiberias. After Breakfast, we will explore Tiberias. We will enjoy a boat ride on the Sea of Galilee, visit the city of Magdala, the town of the famous resident Mary Magdalene see the ruins of this village and then make our way to the hidden waterfalls outside of Tabgha. After our morning in Tiberias, we will make our way to Jerusalem. 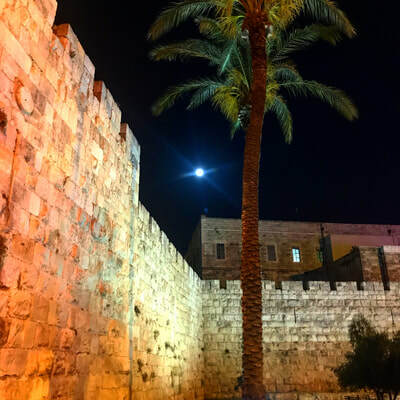 As we head to Jerusalem, we will visit Jericho the oldest inhabited city in the world. In Jericho, you view the Mount of Temptation, where the Devil tempted Jesus during his forty-day fast (Luke 4:1). After our visit to this mountain, we continue to Jesus' baptismal site on the River Jordan (Matthew 3:13-17). After some time at the Jordan River, we will transfer to Jerusalem to check-in to our hotel and enjoy the evening with dinner and exploration. We will enjoy our breakfast and make our way out for some fun today. Today will include Bethlehem and Ein Karem. We will be able to visit the birth place of Christ in Bethlehem, and the Shepherds Field. We will also make our way to the town of Ein Karem. 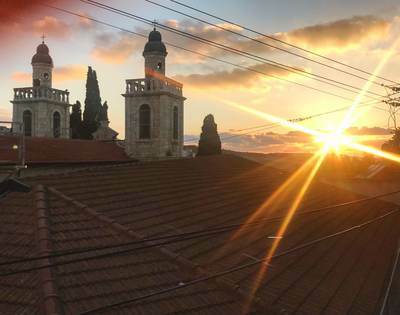 This town has two sites, the Church of Nativity where we commemorate the birth of John the Baptist and the Church of the Visitation where Elizabeth spent 5 months of seclusion. We arrive back in Jerusalem with plenty of time on your own. Shop and explore. Today will be a busy one. We will make our way over to the Dead Sea, the lowest place on earth. The lake is made up of 34% salt and contains healing minerals and muds. Float and relax and don't forget to get a mud bath! We will make our way into and around the old city walls of Jerusalem. We will visit, (not in order) Mount of Olives, Gethsemane, Mt. Zion (upper room), Western Wall, and the Via Dolorosa - Holy Sepulchre. A full day of wonder, beauty and awe! Enjoy your evening to buy the last minute souvenirs or just relax. Nights in quaint boutique accommodations, double rooms, single occupancy additional $200. Airfare to and from Europe. All flights need to fly into Tel-Aviv Israel. We will give you all the information you need to make these arrangements correctly or we can book these flights for you. Group is limited to 6 - 10 participants, book now!